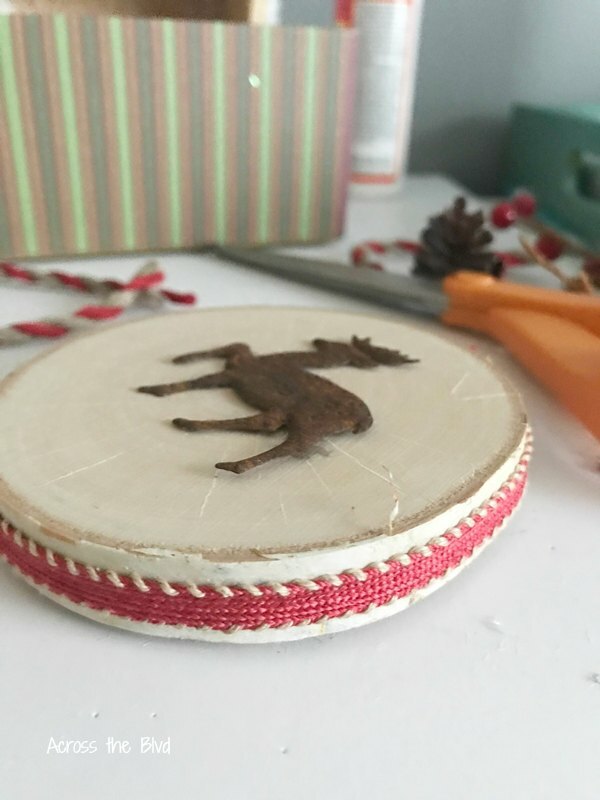 A Wood Slice Deer Ornament is an easy DIY ornament to make. 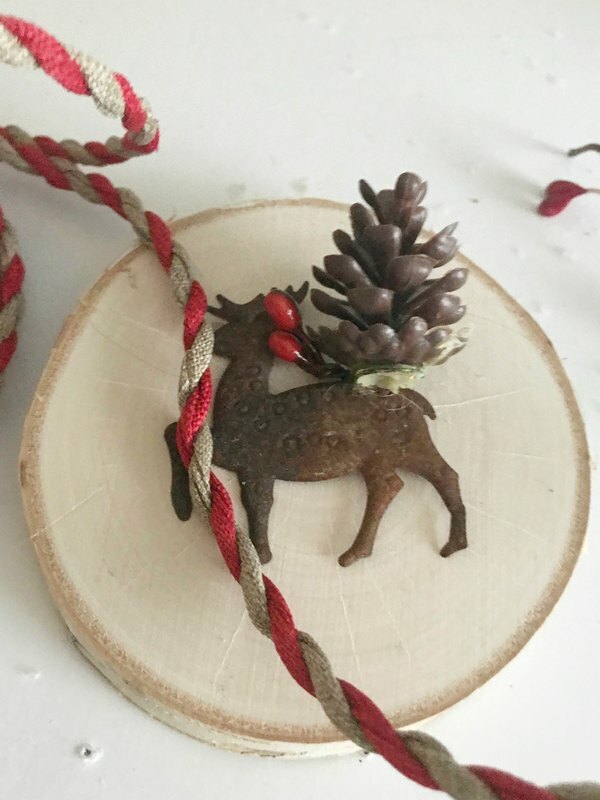 Ribbon, floral picks, and glue are all you’ll need to add to the wood slice to create a rustic ornament for your tree. 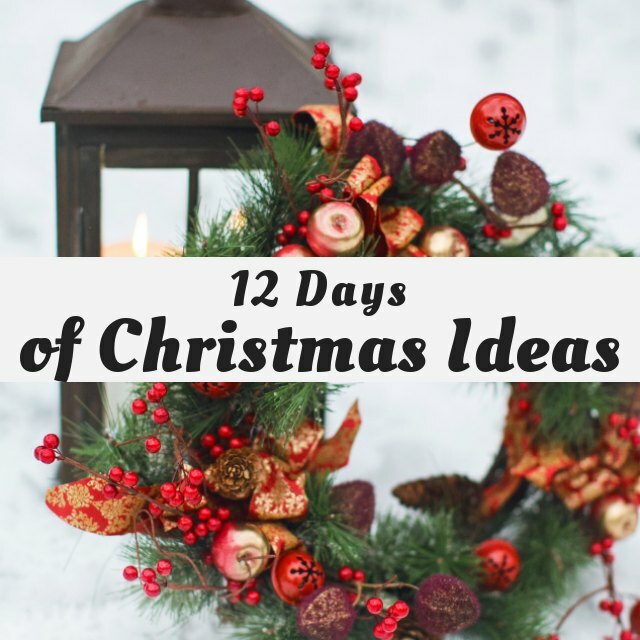 On the second day we shared a DIY Recipe Card Holder Hostess Gift. On the third day we shared a Christmas Countdown Ornament. On the fourth day we shared Buckets of Snow Ornaments. On the fifth day we shared Buttered Rum Glazed Pecans. This ornament takes only minutes to make and I had almost all of the supplies on hand. If you’re a crafter, chances are you have most of them, too. All of the supplies can be found at any craft store. The metal deer were part of a berry stem floral pick that I bought at JoAnn Fabric and Crafts. It had frosted berries on it, too that I’m using for another project. I love when I can find several uses for one item. The birch wood slice is one that I’ve had in my craft stash. They can be purchased at any craft store or you could cut your own. These can be embellished with parts of any floral picks you have on hand to match your style. Use wire cutters to remove the deer from the floral pick. I used two of them, one for the front and back of the ornament. Use hot glue to hold them in place. Add ribbon to the outside of the wood slice. Use small dots of hot glue along the way to keep it secured. Remove a mini pine cone from a floral pick and glue on top of the wood slice. 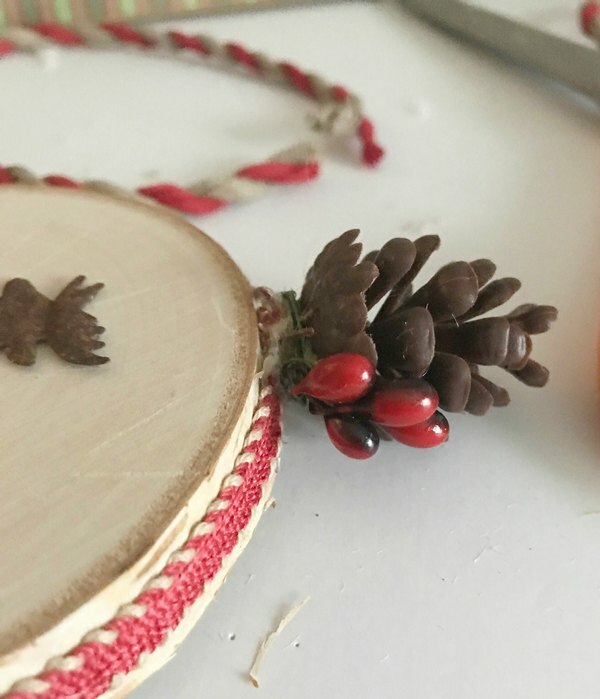 Remove berries from a floral pick and glue three at the base of the pine cone to cover the gap and the glue. Use a sturdy twine ribbon to hang the ornament. Loop the ribbon and hot glue to the back of the ornament. Add a berry to cover the glue. Remove four small snow flakes from a floral pick and glue them onto the wood slice, two on the front and two on the back. 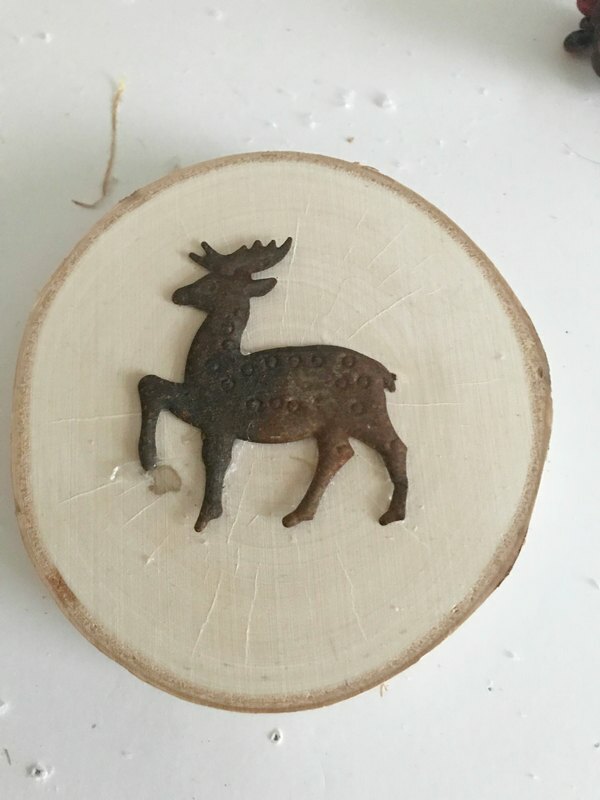 Making this wood slice deer ornament took less than ten minutes. 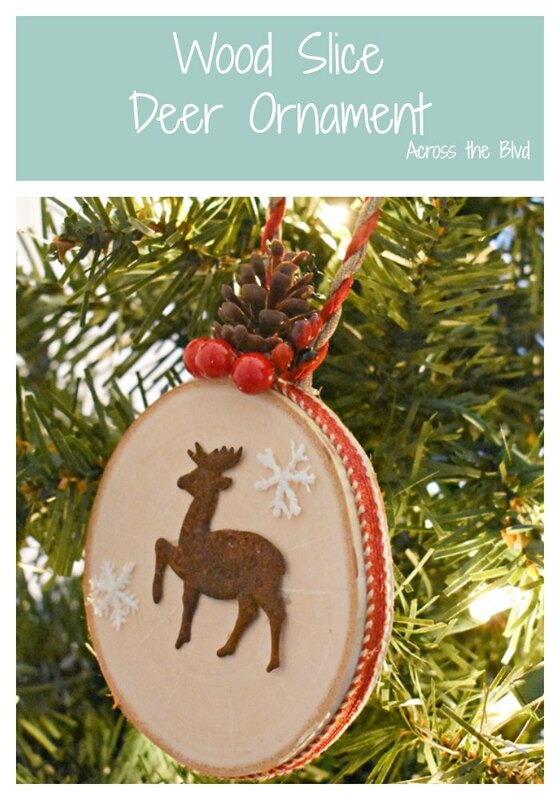 I love easy diy ornaments and I’m looking forward to seeing more in the link up below. The deer is so handsome and I love it. 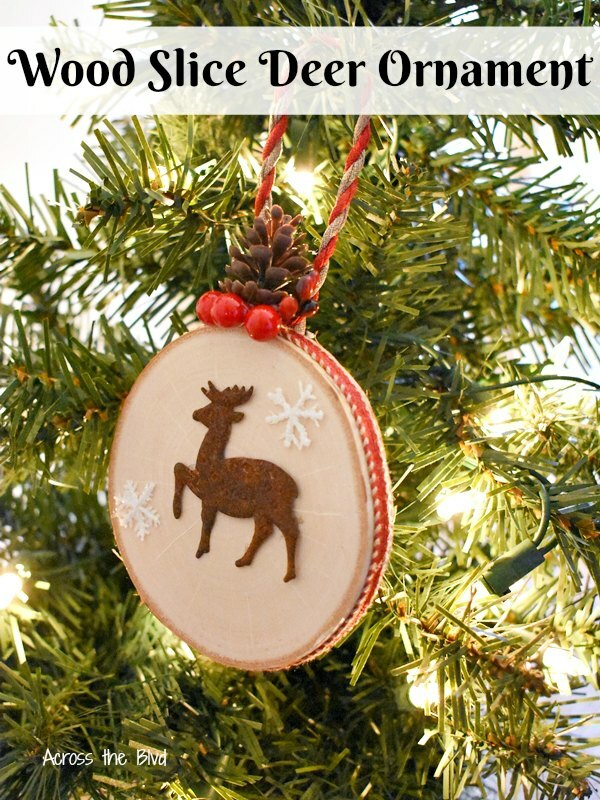 I really need to make some wood slice ornaments for my tree, it’s on my to do list! It looks beautiful on the tree. Thanks! 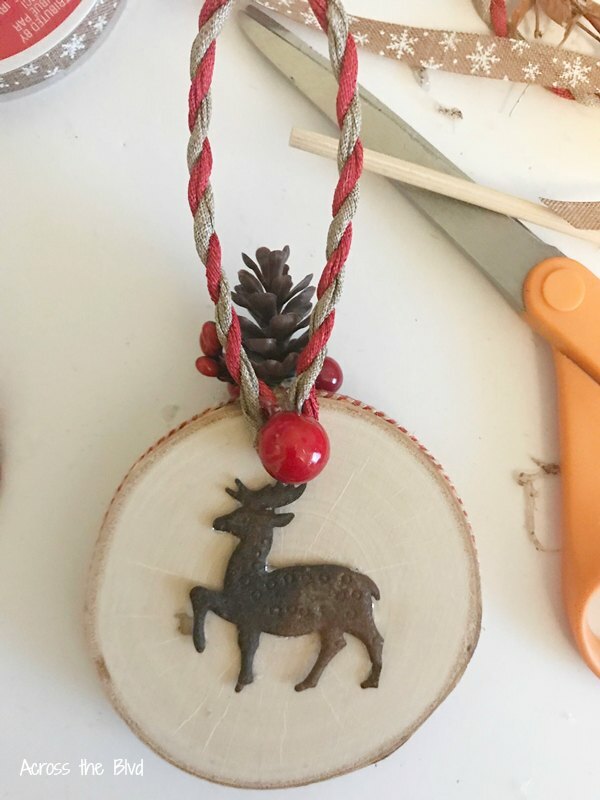 I love wood slice ornaments of all kinds and this one was super easy to make. Thanks, Lexi! It was fun and easy to make. 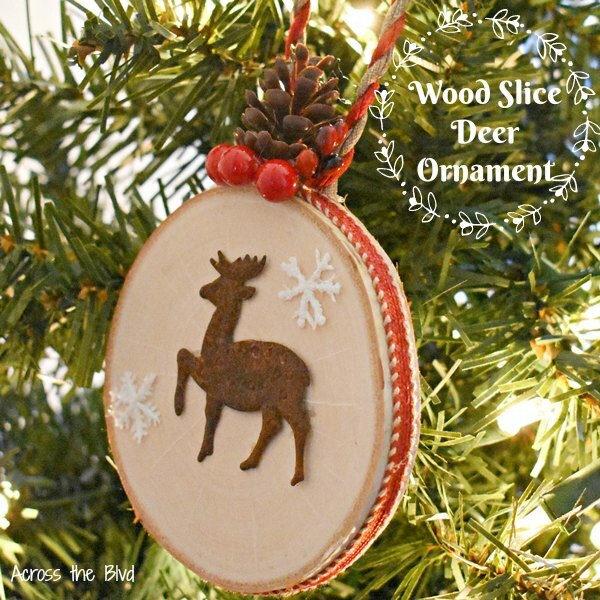 Now this is an adorable wood slice ornament I can do! Those woodburning ones are lovely but scare me. Very cute and like how you wrapped a ribbon around it too! I have plans to do some woodburned ones, too. I haven’t experimented with my woodburning tool very much, but it’s on my to do list. Thanks, Marie! I love deer!! This is such a pretty ornament. You’d never guess how easy it is to make. Love it! I love using deer for Christmas decor. Thank you, Marie! Thanks, Leanna. These only take minutes to make. I’ve made several of them in under 30 minutes. Your ornament is so cute! I love the deer! I need to give wood slice crafts a try. Thanks, T’onna! They are easy to make and there are so many different ways to put them together. I love how you embellished the wood slice. And how the deer is prancing in the snow. It is such a sweet ornament. I really liked the deer, too. Thank you, Debra! Love that little Deer! So sweet! This is gorgeous! Everytime i see the wood slices at michaels i want to buy them. Now i can finally justify that purchasE! I love making wood slice ornaments partly because of how quick and easy they can be to make. Thank you, Heather! 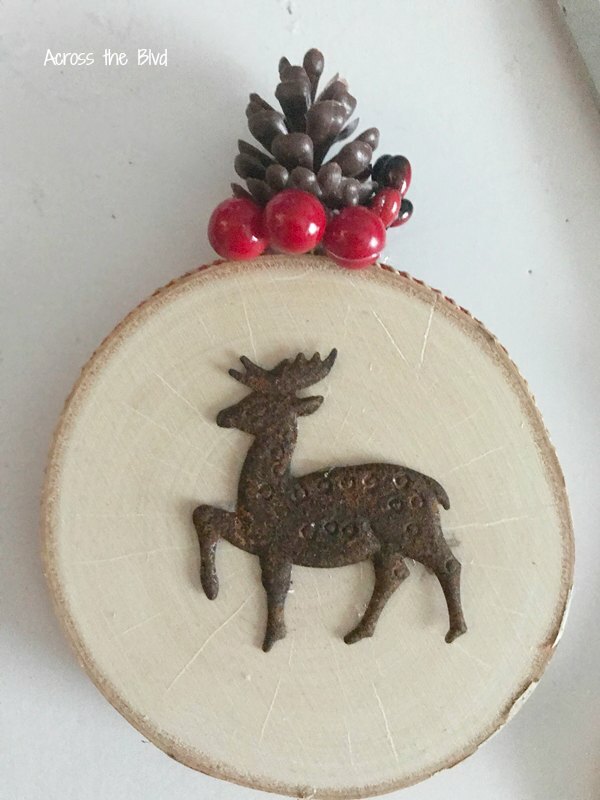 Your wood slice ornament is so pretty, Beverly! I love the ribbon around the edge…what a great idea! Thanks,Wanda! I like to give my DIY ornaments finishing touches like the ribbon on the edge. It reminds me if my grandmas favorite ornaebtz. What. Lovely memory. Glad to have sparked a memory for you, Trisha!